I work in a somewhat untypical field for Blender. I am trying to prepare medical image data for fluid mechanics analysis. I use Blender to improve the mesh and the general structure. So far (after about 8 work with Blender) this has worked quite well, but I can’t create a perfect edge at the end of the geometry. I need this to define an inlet for the flow. How do I make the edge smooth and close with a face? You can try Loop-Tools (Plugin). If the LoopTools don’t appear in your menu, you have to activate them in the User-Preferences->Add-ons. Could also cut it. Bisect tool, intersect (knife) tool, knife, or boolean modifier. I tried the Loop-Tools Plugin and it worked great. However, there are still some leftovers around the edge. How would you deal with such things? Simple deletion is not so easy, because the face seems to depend on it. Now that you’ve made it nice and flat, you’re just seeing that the edge loop is not perfectly circular. 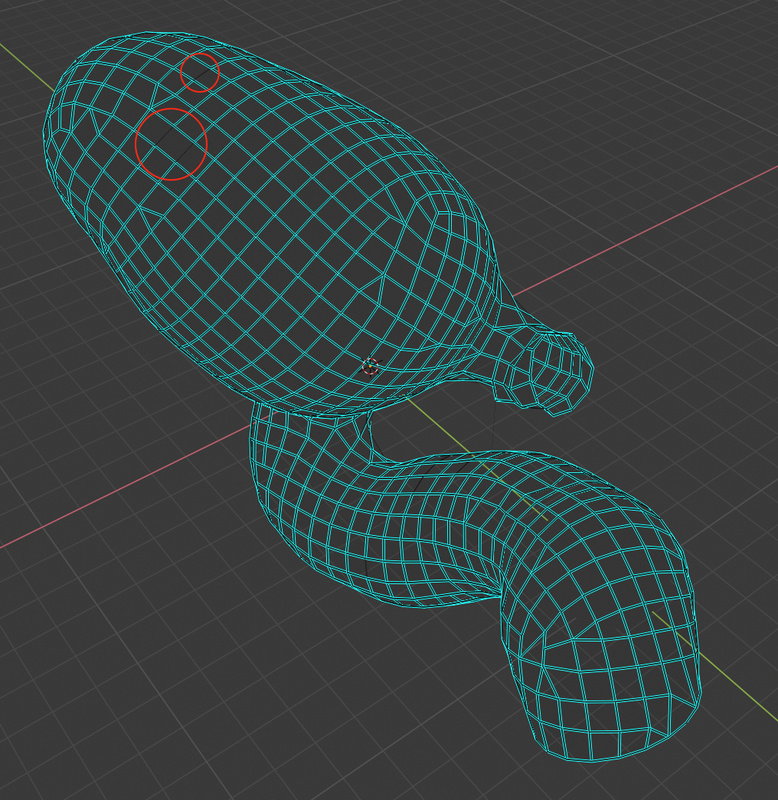 Using the “To Sphere” tool can fix this… select the edge loop again (or just the face, I guess), snap the 3d cursor to it, hit Shift+Alt+S and then drag to get the desired ‘roundness’. do you need so many tri’s verts for this shape ? He did say it was being re-purposed from medical image data. I’d think the hi-res is desired. Other than that, scans are often handled like CAD stuff where subdivision or topology flow is rarely even an afterthought, thus a bit of hell with tris. At least it’s something more tangible than a point-cloud. As far as what to do with it? I would have said to form a non-planar n-gon and make use of how averaging works in relation to the generated normal to extrude a little bit along it and then scale to 0 on one of the normal axes (Z?) to flatten it. And then it could be fixed up a bit from there. Not sure if roundness was particularly desired, but the loop-tools already suggested does the trick. Thank you so much for your help so far!! You are treating me very nicely despite the noob that I unfortunately am. Yes - as @pauljs75 said, the data is taken from a medical scanner and therefore, the mesh is relatively ugly. Since I want to use the shape as for fluid dynamic simulations, I would rather prefer a more elegantly/simply described shape. 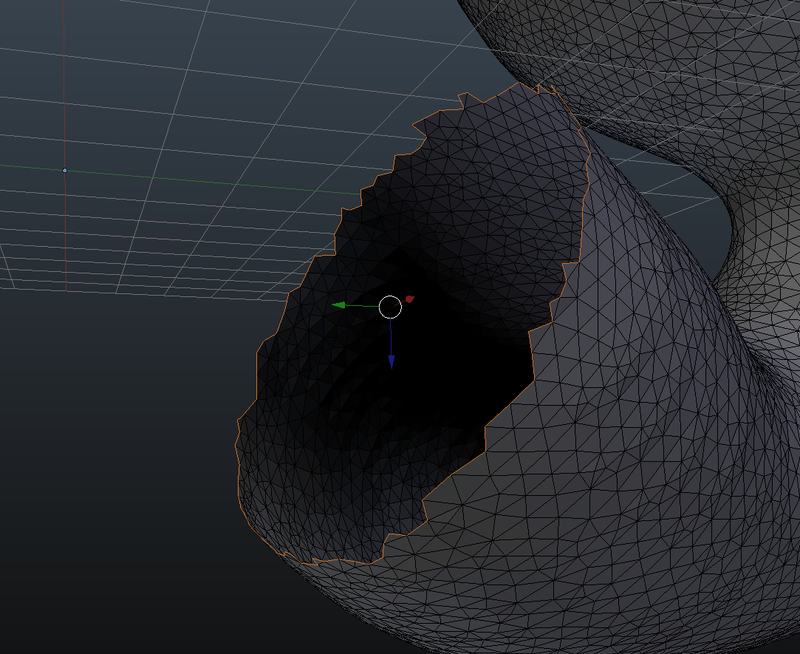 But I don’t know how to simplify the mesh without completly re-meshing/re-modeling the entire structure. I have been following this youtube-video for the postprocessing of the data. My data looks quite similar - do you think this process is wise? hard to tell without a more complete mesh to see ! can you show the entire model ? Here is an image of the original geometry. 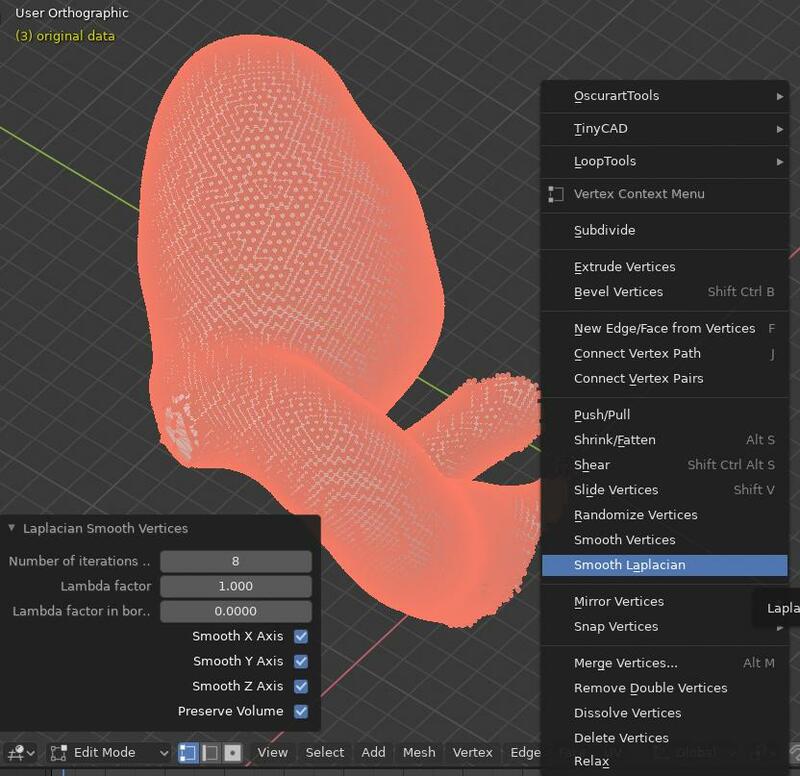 To create a simpler mesh, sounds good. Are there any fast / simple techniques available? This geometry is probably not very challenging compared to other blender projects? it also depends what your goals are for this model! is it to do some high res rendering in 3D? or a lower res model can be enough ? any need for thick walls or simple wall no-thickness? do you know what the constraints are for this external soft ? are there other things added to this part ? any materials textures to give it a more realist look ? is it possible to upload file for this if not too big ? 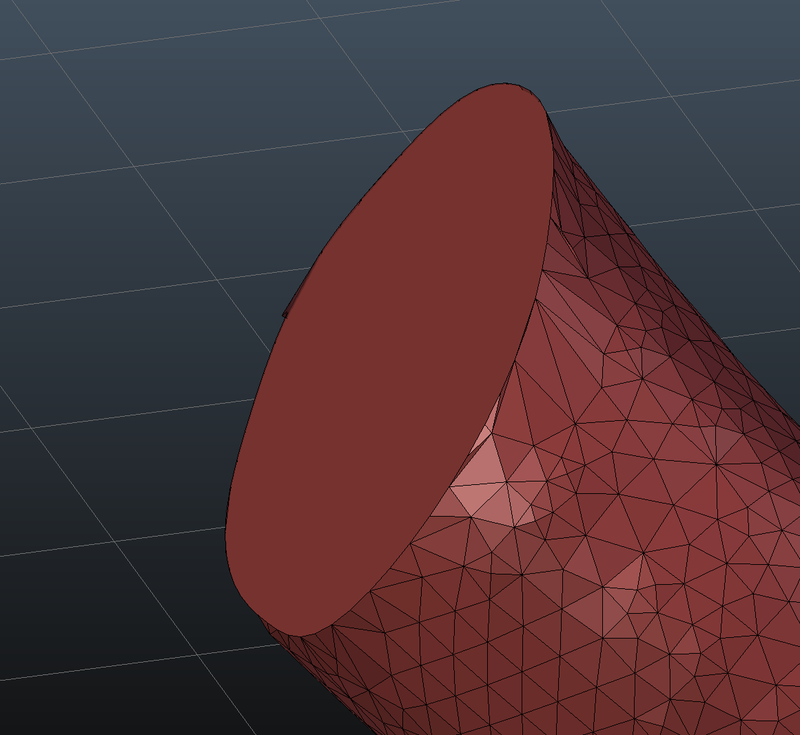 As an end result I need a good quality mesh of the inner layer and the outer layer. So basically the structure with / without an added wall thickness. I don’t need the model for visualization / rendering etc. I have smooth the original data with “Smooth Laplacian-AddOn” . 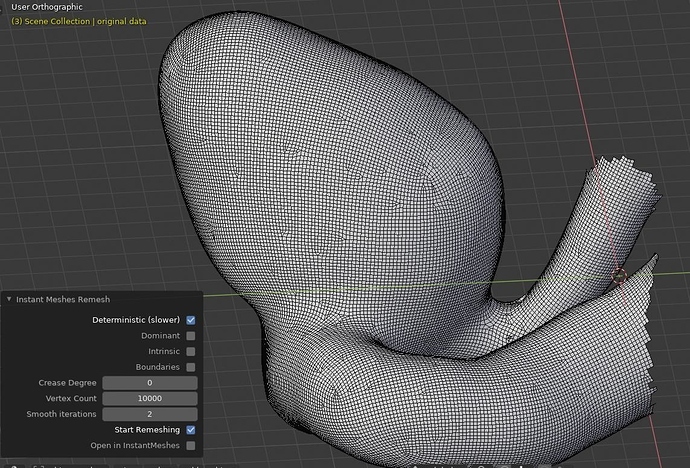 Remesh with “Instant Meshes Remesh”. Cut the Ends with the Bisect Tool. 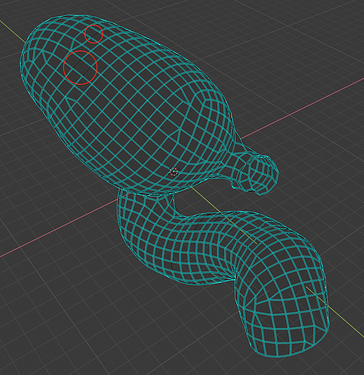 And give the Object a Smooth-Modifier. oh wow - that looks very good. can you maybe give me the exact values that you put in? I didn’t take the laplacian smooth modifier, I took the addon. Play a little with the values. Thank you - Could you maybe post me a link to the addon? It worked very well so far! I have one more question. When looking at the mesh, there are certain edges, which are black and not colored. I attached an image for illustration. What are they and how can I get rid of them? Looks like you give the Edges a Bevel Weight. Look at the Vertices- and Edge Data. Just delete the faces and recreate them.